Lovely blog post again Tamami. Thank god that you are ok, you mean a lot to many people and not just your family! You mean a lot to us loyal blog readers and I am sure many others like your friends and your customers at the market. So please do look after yourself! The last sentence ‘You mean alot to yourself…’ really resonated with me too. Thank you! ps: and yes I am looking after myself too! Dear Tamami, so good to read your writing again, and such lovely posts on your time in Japan, thank you so much for sharing. What you have written about today has particular relevance: my older child has just started Reception – the school lunches seem reasonably healthy, and delicious, judging from the daily pudding reports from my pint sized food critic (too much custard, not enough crumble – can be improved.). I am gobsmacked at how much effort the Japanese schools put into into feeding and educating their children, and establishing communication and a common set of values with their parents – this is a reflection of a culture with a genuine respect for food and nature – but at the same time, I become almost indignant, wondering why we cannot do the same here in the UK. I must confess I love also the illustrations; I can’t, however, try as I might, to decipher the colour-coding, and what the numbers represent, eg. “Egg… (red)… 20.00”. Dear LS, thank you for writing your valuable comment here! – the numbers I think are weight in gram. – – YELLOW is grains, starch, fat products like butter & oil, sugar. These have sugars & become energy power & body temperature. – – RED is animal, fish, egg, pulse, dairy, seaweed. These contain a lot of protein & become your blood & meat. It will help you grow. – – GREEN is vegetables, fruit. These contain vitamin, mineral & fibre. It will maintain your wellbeing. I guess the menu was indicating that it has considered & included all three colours in to the lucky Japanese child’s meal! And oh, by the way, their dinner-money is pretty much the same as here. Around £2.30 a day. – Shocking don’t you think? I know which one I’d rather have! “For most Japanese school children, school lunches are more than just a tray of food. 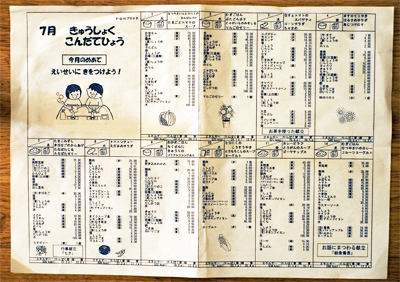 Gakko-kyushoku, school lunches, are an integral part of their studies. 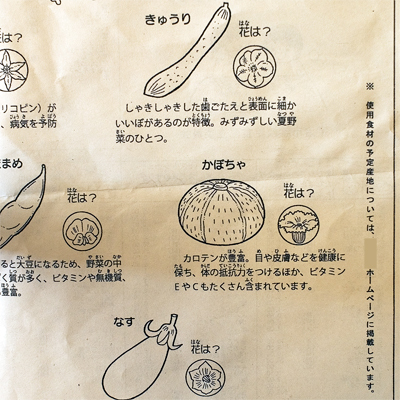 Along with tasty meals, Japan’s unique kyushoku system serves up some very important lessons in nutrition, health, cooking, social skills and more. Most public elementary and many junior high schools in Japan provide lunches for their students. These meals, paid for by monthly school lunch fees, are prepared in kitchens within the school or at school-lunch centers serving several schools. 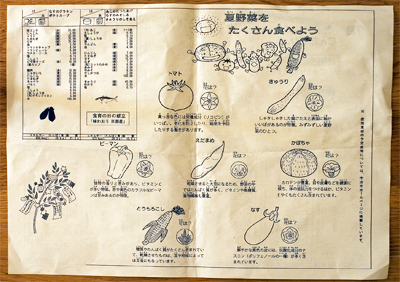 School lunches in Japan are an integral part of a school’s educational activities: in fact, school lunch instruction is defined as a special classroom activity. Lunch programs are designed to help school children understand what constitutes a nutritionally balanced meal while learning the fundamentals of proper eating and table manners. Children deliver and serve the food themselves and eat at their desks in the classrooms with their teachers. Each week, different students are appointed kyushoku toban – lunch staff. The process of taking responsibility to prepare, serve, eat and clean up after lunch gives school children a real work experience. These kinds of cooperative activities help to build a sense of service and a spirit of harmony. In addition, lunchtime presents an opportunity to apply skills learned in homemaking, social studies, biology and other subjects. How interesting to read about the school meals system in Japan, I was astonished to read how much information is given to parents there. I wonder if our government is aware of this and if anything along the same lines would ever be introduced here, somehow I doubt it. I am so relieved that your little scare was not anything serious, I can guess how you must have felt. We are going through something like it at the moment, my husband is having treatment but I must praise our NHS , no time has been wasted in getting him all the right treatment as soon as he needed it. 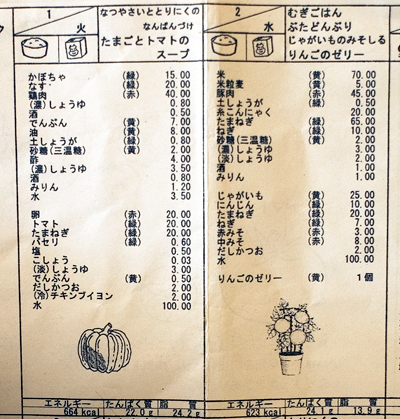 Yes, wouldn’t it be wonderful if UK schools put more importance in meals like they do in Japan? :) It could start with something simple like printing out menus every week. (Surely not a huge ask?) And ultimately stop the use of processed foods completely I guess. Cooking from scratch on site would be amazing, compared to asking outside caterers (who are for-profit I understand?) to deliver. Just last week I had the opportunity to observe the canteen during lunchtime – that particular day, it was pizza slices (tomato & cheese), salad & chocolate cake. My son says there is normally an assistant teacher per long dining table to look over the children to see if they eat properly, and that they prompt the children to try the salad bar. – The processed pizza and cake combination was a far cry from the nutritionally balanced Japanese menu of “summer vegetables & marinated chicken, egg & tomato soup, rice, milk.” from above article, it was so painful to compare. About your husband, I understand so well what you & your husband must be going through… Dealing with big illness can be tremendously difficult, don’t you think? Like how it could be mentally draining & how it disrupts the everyday living that we thought was going by quite normally. – I must say, one thing I’m really impressed with about UK is that there is a publicly funded healthcare like the NHS. In many other countries, it isn’t free. For example, in Japan, the patients have to pay 30% of medical costs! In the U.S. school lunches are big money for corporations. They prefer to maximize profit, which is one reason why you won’t ever be seeing Japanese-style menus anytime soon. One school system classified ketchup as a vegetable. I hope the Dr. gave you meds to take care of the infection. Glad it wasn’t anything too serious. I need to get my mammo in Nov., will be getting flu shot in Oct. Trying to get a ‘body scan’ (to check moles/potential skin cancer from sun exposure..yea, when you’re in your 50s things do pop up. I suppose when money’s involved, the priorities/ the target shifts toward other things (like keeping the fat cats happy!) than to feed the children properly… A real shame. And when those cats (with only their own interests) are on the board to make decisions, it’s a double shame. Great that you are on top of keeping check on your health with those tests! Hello Tamami, thank you for the detailed explanation of the colour coding, tips about private healthcare (something I have always been tempted to look into – I applaud the NHS principle but I also think a system that is under-financed/over-subscribed will benefit from having people who can afford to pay, paying for their own healthcare… while still contributing to the NHS via their taxes!) and also, for the excerpt from the Kikkoman website. It demonstrates a holistic approach to nutrition – from the big corporations to schools to the children serving each other and learning about the producers, farmers… and then bringing that home. Hi! I have followed Coco&Me for a while now and LOVE your blog! 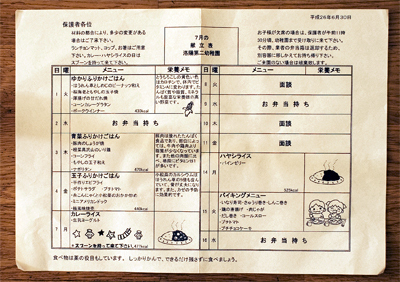 This post on school lunches in Japan intrigues me. Such useful information! Lucky kids! Would you give me permission to do a blog post at http://yummymontana.blogspot.com about this blog post? I would like to use one photo, too, perhaps the close-up of the vegetables, if possible. I am hoping such a post on my blog will encourage people here in Montana to do something similar for schoolchildren. Also, I hope it will show my readers what a terrific blog you have! It’s truly fantastic of you to try encourage your Montana readers to do similar. Sometimes, it’s only when one realises the others are doing better that a change for the better can be brought on. If Japan can do it, it’s not impossible for other countries to deliver a similar standard, no? This was a brilliant post yet again about the wonders of Japan. I am so impressed. In India, we can’t even imagine getting a food menu of school meals, much less a detailed one like this. Most schools here don’t even provide the option of meals, children have to take packed lunches. On a different note, I am so so glad you are ok. Lumps are the scariest. I hope the infection has healed now. Even I had a health scare recently and I can’t tell you the tension and agony I went through while waiting. On the day the results were due, I couldn’t even gather the courage to go to the hospital, I sent my husband instead to collect the reports. Silly, I know, but I was so scared not just for myself but for my family too. And having access to so much information (read scare-mongering) on the internet really doesn’t help during such times, does it? Anyway, I am glad to say I am ok too and that’s why this post struck a particular chord with me. We take our health too much for granted and worry about silly things but without health, everything else is useless really. While I am ashamed to say that I have not really made much of an effort to take better care of my health since then, your post has really encouraged me to start doing it. It reminded me of the feelings I had at that time and my promises to myself. I am going to really try very hard now and I hope you will continue your good efforts too. Thanks so much for this post. Oh, by the way, I also wanted to mention that patients in Japan are relatively lucky that they have to pay only 30% of the cost. In India, we have to pay 100% of the cost, here the government hospitals are so poor that the only real option is to go private and the more money you spend, the better quality of care you receive. I think I am so lucky that I can at least afford it. It is so sad that so many people don’t even have access to basic healthcare :(:(. Sorry for the delay in replying…!! As you know, I work on Saturdays & by the time I come home, I always feel so knackered!! Yesterday at the market was very good though, sold all bar one slice, which I made Mr.D buy, so that I can pretend that I’ve ‘sold out’. Lol! :) It’s all about the mindset y’see, makes a huge difference…! Talking about lunches in India, I saw a movie called ‘The lunchbox’ in the aeroplane back. Really good & I recommend it if you’ve not seen it yet. By the end, I was lusting after those tiffin carriers. (A lady sells beautiful ones down at the market, so I might get it!) I was also intrigued by the dabbawala delivering home cooked meals. I suppose people in India place importance & pride on eating home-cooking by your wife than buying lunches in shops? – Here in England, majority of office workers purchase their meals outside. It’s in reality a great and helpful piece of information. I’m glad that you simply shared this helpful information with us. Please stay us informed like this. Thanks for sharing.